Once an experience is running in Player on iPad and Android, a user cannot exit that experience and return to the Experiences Panel unless either the experience or Player is configured to permit it. This article identifies how to implement this ability to exit a running experience. As with any application on the iPad, a double-click of the Home button will display the list of running applications and can be used to exit Player entirely. As with any application on an Android tablet, a long-click of the Home button - or a corresponding click on any device-specific button that displays the list of running applications - can be used to exit Player entirely. NB: this works on all devices. Pressing on the button will exit the player. Uniquely for Player for Tablets, a shake of the iPad or Android tablet will exit the running Player. 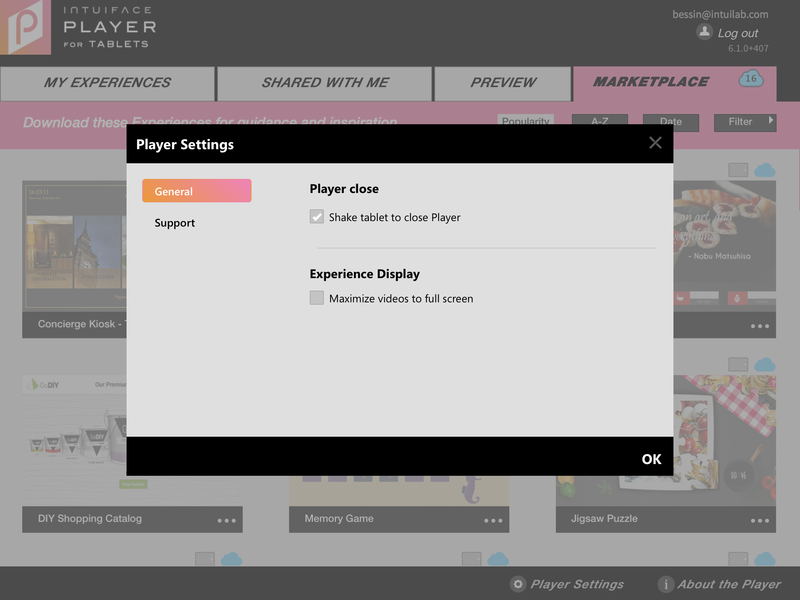 This shake to quit ability can be toggled on and off using the "Player close" property in the Player Setting panel, accessed via the Player Settings option located at the bottom of Player's Experiences panel.